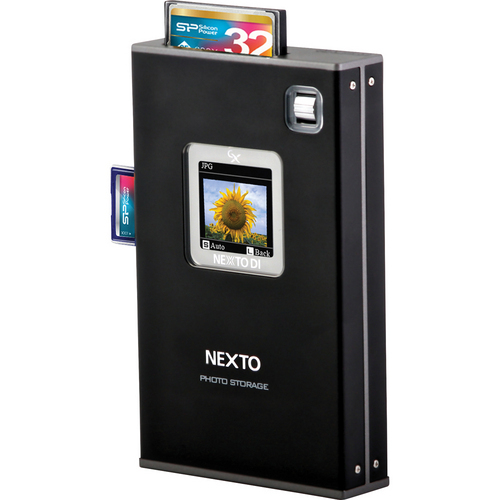 NEXTO DI backup drives offer the ability to back up memory cards in the field without the need to fire up a laptop. You can catch an overview of the NEXTO DI drives from Barry Morrill in the above video from the PhotoPlus 2011 show floor. The NEXTO DI NVS1501 backs up and previews both photos and video from CF, SD, SDHC and SDXC cards. It will back up CF cards at up to 80 MB/s. The NEXTO DI NVS1501 does bit by bit verification, checks integrity of data, has a 2.4” LCD screen for checking imported media. You can download your images via USB 2.0 and FireWire 800 when you get back to a computer. You can find pricing and additional spec details on the NEXTO DI backup devices here at B&H Photo. Very cool, but extremely expensive. Would love to see a comparison done against the Sanho units as I have been looking at them for awhile now. I take that back somewhat. The 2730 is pretty reasonable, especially in the 750GB configuration.